We invite everyone to test the next version of IBProvider, which allows to work directly with Firebird v3 through INET (TCP/IP) connection. The current assembly v3.34.0.22607 has passed functional and load testing. Improvements and changes are not planned. The release will be available within a month. Database .NET 19.8 and dbMigration .NET 4.0 released! dbMigration .NET 4.0 is a simple, easy and intuitive multiple database migration and data synchronization tool, With it you can easily migrate schema and data between different databases without complicated procedures. 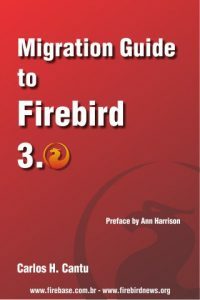 Supported databases: Firebird 1.5~3.0+, PostgreSQL, SQL Server, SQL Azure, LocalDB, MySQL, Oracle, IBM DB2, Informix, HP Vertica, NuoDB, Teradata, Sybase ASE, SQLite, SQLCe, Access, dBase, FoxPro, Excel, ODBC, OLEDB, Text…etc. Firebird 2.5 package is now replaced by Firebird3.0 in Debian Unstable. one of them possibly without upstream supprt. SQL SECURITY clause is now implemented in Firebird git master tree. SQL Security clause part of SQL Standard (2003, 2011) Feature is implemented in Firebird master git tree. Firebird 3.0.1 is packaged and ready for testing in Debian unstable. I was presenting this idea on this year’s Firebird Conference. It’s an idea, working with some constraints of Firebird, but one can take it as an inspiration and maybe extend it to another usage on another platform. We had quite a productive discussion about possible improvements (I’ll describe mines at the end), but unless the people will provide the ideas in comments here too, you’ll have to use your own brain (you should’ve been there ;)). I’ll show you the initial idea with some simple speed improvement of PSQL code itself. And then describe options in how to store it better, mostly because it’s very specific to needs and you’ll need to tune it for your scenario.